As was stated in the last chapter, there is more than one type of field-effect transistor. The junction field-effect transistor, or JFET, uses voltage applied across a reverse-biased PN junction to control the width of that junction's depletion region, which then controls the conductivity of a semiconductor channel through which the controlled current moves. 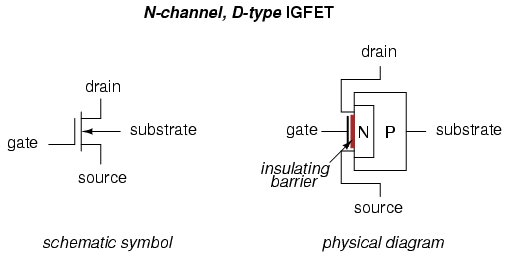 Another type of field-effect device -- the insulated gate field-effect transistor, or IGFET -- exploits a similar principle of a depletion region controlling conductivity through a semiconductor channel, but it differs primarily from the JFET in that there is no direct connection between the gate lead and the semiconductor material itself. 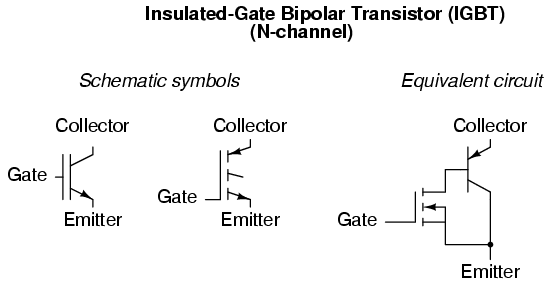 Rather, the gate lead is insulated from the transistor body by a thin barrier, hence the term insulated gate. This insulating barrier acts like the dielectric layer of a capacitor, and allows gate-to-source voltage to influence the depletion region electrostatically rather than by direct connection. 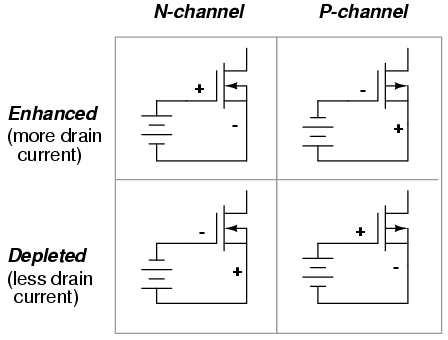 In addition to a choice of N-channel versus P-channel design, IGFETs come in two major types: enhancement and depletion. The depletion type is more closely related to the JFET, so we will begin our study of IGFETs with it. 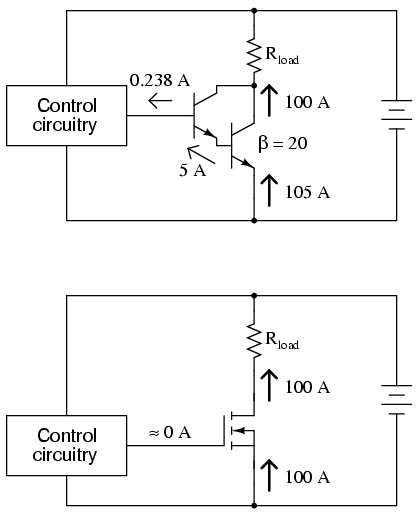 The insulated gate allows for controlling voltages of any polarity without danger of forward-biasing a junction, as was the concern with JFETs. 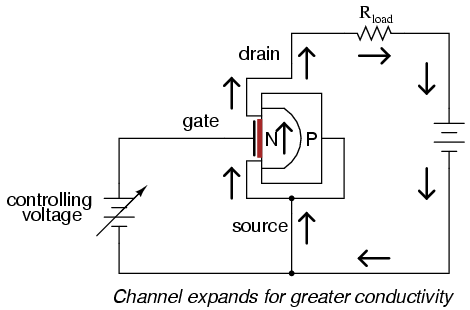 This type of IGFET, although it's called a "depletion-type," actually has the capability of having its channel either depleted (channel narrowed) or enhanced (channel expanded). 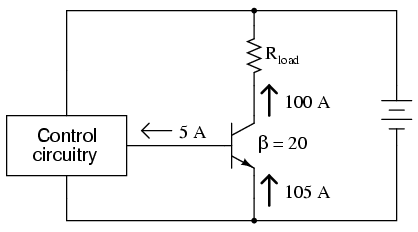 Input voltage polarity determines which way the channel will be influenced. Because of their insulated gates, IGFETs of all types have extremely high current gain: there can be no sustained gate current if there is no continuous gate circuit in which electrons may continually flow. 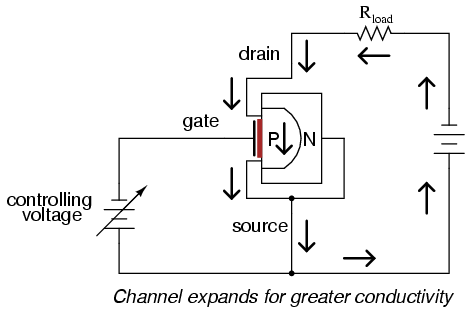 The only current we see through the gate terminal of an IGFET, then, is whatever transient (brief surge) may be required to charge the gate-channel capacitance and displace the depletion region as the transistor switches from an "on" state to an "off" state, or vice versa. 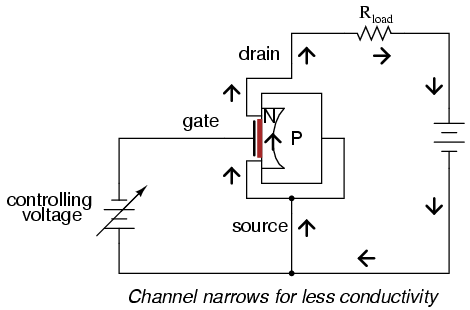 Unfortunately, though, IGFETs have problems of their own controlling high current: they typically exhibit greater drain-to-source voltage drop while saturated than the collector-to-emitter voltage drop of a saturated BJT. This greater voltage drop equates to higher power dissipation for the same amount of load current, limiting the usefulness of IGFETs as high-power devices. Although some specialized designs such as the so-called VMOS transistor have been designed to minimize this inherent disadvantage, the bipolar junction transistor is still superior in its ability to switch high currents. 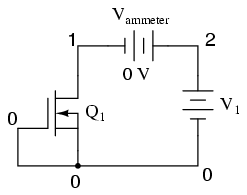 In essence, the IGFET controls the base current of a BJT, which handles the main load current between collector and emitter. 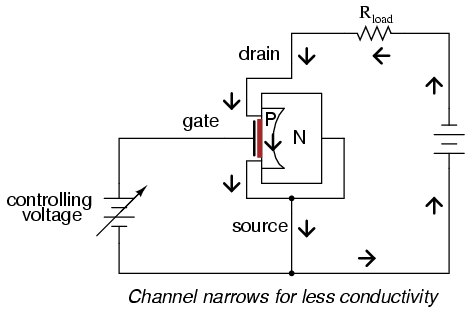 This way, there is extremely high current gain (since the insulated gate of the IGFET draws practically no current from the control circuitry), but the collector-to-emitter voltage drop during full conduction is as low as that of an ordinary BJT. One disadvantage of the IGBT over a standard BJT is its slower turn-off time. For fast switching and high current-handling capacity, it's difficult to beat the bipolar junction transistor. Faster turn-off times for the IGBT may be achieved by certain changes in design, but only at the expense of a higher saturated voltage drop between collector and emitter. However, the IGBT provides a good alternative to IGFETs and BJTs for high-power control applications.